Unique Maritime Group, an integrated turnkey subsea and offshore solutions provider, announced a joint venture agreement with OEG Offshore (OEG), to offer the rental and sale of offshore equipment in the Middle East region. The new joint venture company, OEG Unique, which will be based in UAE & QATAR, will provide local access to OEG's full range of over 200 individual certified designs of DNV 2.7-1 certified Cargo Carrying Units (CCUs) and A60 modules across the GCC countries. The partners have jointly invested more than $1 million in new equipment including offshore containers, baskets, half heights, tanks and waste equipment rated to the leading international standards DNV 2.7-1 and EN 12079. The sales and rental fleet is located in bases at Sharjah, UAE and Doha, Qatar and is available for immediate mobilization. The modern and diverse fleet will be supported by OEG Unique's customer and technical support resources from facilities in Dubai, Sharjah, Abu Dhabi and Qatar. On this occasion, Sahil Gandhi, Director at Unique Maritime Group commented, "We are extremely pleased to be venturing into the business of offshore containers and fleet. This is in line with our growth strategy for this year. 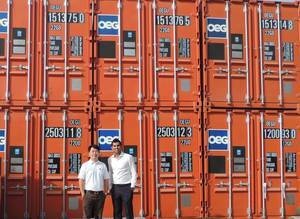 By partnering with OEG Offshore, who is an industry stalwart in this field, we are confident that the new inception 'OEG Unique' will offer the range of offshore containers (CCUs) and A60 cabins specialized or customized products certified to DNV 2.7-1 / EN 12079 to customers in the Middle East region. We look forward to a stronger brand presence in this business over the years to come." Daniel Lim, Group Asset Director at OEG Offshore asserted, "We are delighted to be working closely with an experienced and respected Middle East partner that has an established reputation for quality service and support and shares similar business ethos. These new bases are the next step in our ambition to offer our customers a first class service in all the key offshore oil and gas markets. We are pleased that the resources and systems are already in place to meet demand and indeed have already commenced operations with key clients."